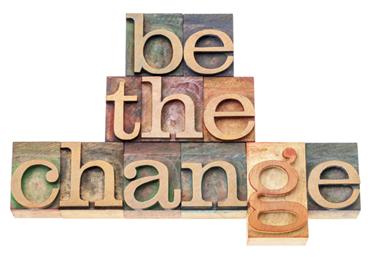 Show you how to start your change initiatives on the right foot, and help you do it. Show you how to keep your change initiatives on track, and help you do it. Show you how to accelerate and maximize the benefits expected from your change initiatives, and help you do it. This situation and the change desired includes, impacts and involves other stakeholders. Develop and share the same knowledge of the current situation, the initial conditions in place. Develop a better common understanding of where you are heading if you let things evolve while doing nothing to change current forces at play. Identify the current clues and elements in your environment that play a role in this emerging. Confirm collectively whether or not to deal proactively with your status quo to influence the future that is emerging. Develop a sense of collective urgency to act to protect a viable status or to recognize the need to create new conditions to ensure a more viable, sustainable and happier future for all concerned. Develop a shared vision of where you want to go and the outcomes and corresponding beneficial results desired for the short, medium and long terms. Beat the odds of any currently unmanaged tendencies, unfavorable or not. Enable your collective journey to a better, more sustainable future. Identify, document and communicate your Strengths – Resources, capabilities, “desirabilities”, beliefs, best practices and behaviors you currently share, plus values and point of views you collectively adhere to. Discover, document and communicate Opportunities that relate to your strengths and that you can collectively see while looking at the current situation. Possible courses of actions, fast wins, things to consolidate, new ways to accelerate growth and increase benefits. Discover, discuss, document, share and communicate your Aspirations, your dreams for the future as individuals and collectively, your higher purpose as an organization. Define, discuss, document, share and communicate the concrete, tangible Results that can and must be achieved to meet these aspirations, considering your strengths and the associated opportunities for your organization. It focuses on your real strengths to energize and mobilize your organization and your teams. It looks at immediately actionable opportunities rather than inhibiting action because of limiting beliefs based on perceived or real weaknesses. While acting as your consultant, I DO NOT WANT TO, NOR WILL I propose detailed action plans for you to implement. I believe detailed plans and their implementation strategy cannot be developed and delivered by external consultants, or solely by the upper management of your organizations. The HOW belongs to the Last Planners: those who do the work are those who plan the work. In the end, you are the only ones who are responsible and accountable for your actions. I’ll never provide you with a detailed plan and never lead its implementation. When the time comes for detailed planning and implementation, I put aside my consultant’s hat and replace it with my coach’s heart. 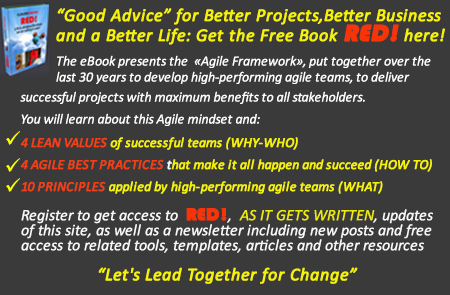 I then coach you, your team and collaborators to work in the best agile, collaborative and co-creative manner possible. Are you ready to initiate conscious change, start a collective journey (project, program or other initiative) toward a better, richer, more beneficial, fulfilling future for your organization, your community, your collaborators, your team and yourself? Contact me. I will show you, as your consultant, how to do this, define the best course of action with you and support you all the way to your desired situation. We can meet face to face if I am close by. If I am not, we can meet by telephone, by skype or by video conferencing to discuss your needs, my role, pricing and other conditions.